Snow-capped huts, mitten-warming mulled wine and the tantalising aroma of roasting chestnuts. 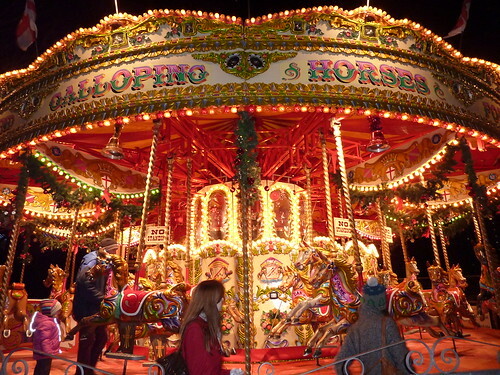 Teresa Curran revels in the festive spirit of her favourite European Christmas markets. When I was growing up in New Zealand I would listen with incredulity to Christmas songs about chestnuts, sleigh rides, warm fires and snowmen. My family would sometimes receive postcards with snowy scenes: a robin, perhaps, looking jaunty in a winter wonderland. Shop fronts would have fake snow painted on their windows, or Christmas trees might be sprinkled with snowflakes. We would troop to our grandparent’s house at Christmas and eat copious amounts of hot roast dinner, followed by plum pudding and mince pies and then fall into a slumber in the warm summer sun. Times have changed, at least in my family, and these northern hemisphere traditions have all but disappeared. Our celebrations now seem much more suited to the summer and although the festive flavours linger, it is an altogether different celebration to the one performed in the short days and long nights of a European winter. Imagine my wonder when upon arriving in Europe during a particularly bleak winter, I found myself in the middle of Advent and a huge array of Christmas markets. The smell of Christmas is resonant in the spices of Glühwein, in the wood fires and the candles, in the chestnuts (actually roasting) and in the fir trees standing resolute against the snow and ice. 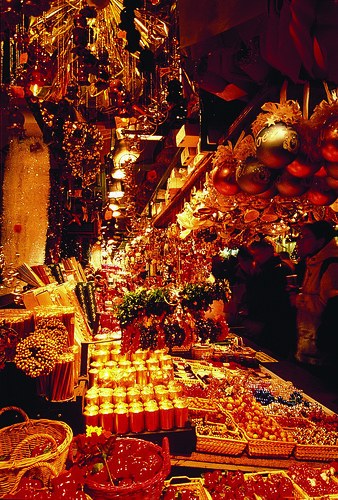 The first European Christmas market I visited was in the Marienplatz in Munich. I loved the lebkuchen iced in shades of red and green and ate far too many freshly cooked bratwurst. It was freezing and we sipped mulled wine and listened to a brass band playing Christmas songs. Town records mention this market in 1642 and 470 years of practice seems to have done the trick. I spent hours trying to track down the perfect glass bauble as a souvenir, although I didn’t find this until I was in Austria. Across the border in Austria I visited the market in Cathedral Square in Salzburg. Here the market seemed to have more traditional gifts. We picked up a Christmas wreath for our table and ate even more sausages. Salzburg was frozen and the advent market had real warmth to it. When in Salzburg, look out for finely-crafted wooden ornaments and lovely woollen gloves. My favourite Christmas market, however, was not one of these huge events - the one I really liked was tiny, no more than 15 stalls grouped in a village square at the base of the mountains. It was here that I found both my handcrafted glass bauble and my idea of the perfect Christmas market. Here you were expected to speak in German, not English. It was a community event, and far more authentic than the huge markets in the city. Where? Well, I'm keeping it to myself for now. But I’m sure there are many, many more like it. Follow Teresa on Twitter for more stories from her travels.